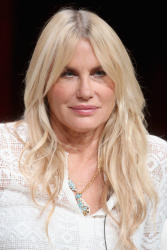 American actress Daryl Hannah gained recognition for her portrayal of Madison, the mermaid, in Ron Howard’s romantic comedy Splash (1984, opposite Tom Hanks). Due to her significant performance, she picked up the 1985 Saturn Award. She was also named one of John Willis' Screen World’s “12 Promising New Actors.” Initially, Hannah gained notice after playing the seductive, pleasure-model replica Pris in Ridley Scott's Sci-fi Blade Runner (1982). In 1987, however, Hannah won a Razzie Award for her portrayal of interior designer Darien Taylor in Oliver Stone's critically acclaimed Wall Street (1987). Athletic, blonde Hannah is also well remembered for playing such roles as the title character in Fred Schepisi's romantic comedy Roxanne (1987, opposite Steve Martin), nerdish hairdresser Annelle Dupuy Desoto in Steel Magnolias (1989), the giantess Nancy Archer in Attack of the 50 Foot Woman (1993, TV), and Jack Lemmon's daughter Melanie in Grumpy Old Men (1993) and its sequel Grumpier Old Men (1995). Her more remarkable roles also include one-eyed, villainous Elle Driver in Kill Bill: Volume I (2003) and Kill Bill: Volume II (2004). Recently, Hannah appeared in Lucky 13 (2005) and Supercross (2005), and will soon play roles in the forthcoming Love Is the Drug (2005) and Living Neon Dreams (2005). Off screen, Hannah was listed as number 96 on Empire magazine’s “100 Sexiest Stars in Film History” (1995) and was named one of Made McCall's “10 Best Female Bodies In America” (1984). Her ex-public relations firm, Los Angeles' agency Rogers & Cowan, is rumored to have taken legal action against Hannah for failure to pay services (June 11, 2005). As for her private life, Hannah was romantically involved with musician Jackson Browne (dated from 1982-1992) before headlining the media with her relationship with lawyer/magazine publisher John F Kennedy Jr. from 1989-1994. The couple had an on and off again relationship, but rumors spread that they never married because Jacqueline Kennedy Onassis' disapproval of her son marrying an actress. After her highly publicized romance, Hannah was linked with magician David Blaine and Run for the Money costar Val Kilmer. In 2004, she reportedly began a new relationship with the boss of New York's Maritime Hotel, Sean McPherson. Daughter of Don Hannah and Susan Wexler (stage producer), Daryl Christine Hannah was born on December 3, 1960, in Chicago, Illinois. Her parents divorced when she was in the first grade. After they remarried, Daryl was one of eight siblings (including half-siblings and step-siblings), consisting of seven girls and one brother named Don Hannah. She is also the elder sister of actress Page Hannah, and the niece of filmmaker Haskell Wexler. Young Daryl was diagnosed as borderline autistic and developed her early attention for movies through a lifelong war with insomnia. In high school, she displayed a certain devotion to soccer by joining the boys’ team (there was no soccer team for girls). She also took ballet classes with Maria Tallchief before switching to drama at the Chicago's Goodman Theatre. She had another chance to study acting with Stella Adler, and graduated from the University of Southern California, in which she majored in Literature. 18-year-old Daryl Hannah received her first taste in front of camera when she landed a bit part in Brian De Palma’s horror film The Fury (1978). A year later, she flew to Los Angeles to fully concentrate on acting. Hannah made her way back to films in 1981 when she was cast in the supporting role of Kim Basinger’s younger sister Loretta in the drama Hard Country (1981), and had her television film debut in Paper Dolls the following year. Her breakout role arrived with the supporting role of Pris, opposite Harrison Ford and Ruthger Hauer, in Ridley Scott's futuristic detective story Blade Runner (1982). Delivering a remarkable turn as the acrobatic, semi-mute android, Hannah began to receive public notice. She next costarred with Peter Gallagher in the comedy Summer Lovers (1982), appeared in the horror film The Final Terror (1983) and portrayed a pupil who becomes involved with a motorbike-riding recluse in Reckless (1984). Starring as Madison the mermaid, opposite Tom Hanks, in the 1984 romantic comedy Splash, Hannah received her first really big break. Helmed by Ron Howard, she perfectly showcased her comic flair and versatility in the film. As a result, Hannah netted a Saturn award for Best Actress and was chosen as one of John Willis' Screen World “12 Promising New Actors” (1984). She solidified her status as a rising new star with her portrayal of Mickey Rourke's love interest in The Pope of Greenwich Village (1984). After her winning performance, Hannah starred as a Cro-Magnon cave girl in the disappointing The Clan of the Cave Bear (1986) and portrayed a performance artist in the comedy film Legal Eagles (1986, also starring Robert Redford), but none of her performances attracted much attention. She received even more negative reviews for playing the role of interior designer Darien Taylor in Oliver Stone's critically acclaimed Wall Street (1987), for which Hannah took home a Razzie for Worst Supporting Actress. In the romantic comedy Roxanne (1987), however, portraying the title character opposite Steve Martin, Hannah gave a fine performance that many critics marked as her best acting since Splash. She next found herself acting with legend Peter O'Toole in High Spirits (1988), was featured in Woody Allen’s Crimes and Misdemeanors (1989) and was highly praised for playing wallflower Southerner Annelle Dupuy Desoto in Steel Magnolias (1989). From 1990-1995, Hannah kept busy with her work on the wide screen. She portrayed a brittle mental patient named Kathy in the black comedy Crazy People (1990), teamed up with Aidan Quinn, Tom Berenger and Kathy Bates in At Play in the Fields of the Lord (1991) and played the lead of Chevy Chase's mixed-up girlfriend in the comedy Memoirs of an Invisible Man (1992). Hannah co-produced and starred as giantess Nancy Archer in the made-for-television movie Attack of the 50 Ft. Woman (1993), gave another memorable turn as Jack Lemmon's daughter Melanie in Grumpy Old Men (1993), appeared in The Little Rascals (1994), costarred with Keith Carradine in The Tie That Binds (1995), was cast as Melanie Griffith's sister in the comedy Two Much (1995) and reprised her role of Jack Lemmon's daughter in the sequel Grumpier Old Men (1995). Hannah drew attention from the public for her behind-the-scene effort in 1993. With her own production company, Girlie Pictures, she wrote, produced, as well as directed the short film titled The Last Supper (1993). Her brilliant work handed her the 1994 Jury award for Best Short. The actress went back to acting in 1997 by playing Margaret, who tries to break into legitimate films, in The Last Days of Frankie the Fly (1997, opposite Dennis Hopper and Kiefer Sutherland). She continued to take on roles in such films as The Real Blonde (1997), Robert Altman's The Gingerbread Man (1998), Hi-Life (1998), Speedway Junky (1999), My Favorite Martian (1999), Wildflowers (1999) and Diplomatic Siege (1999). Hannah also worked for several TV projects like the Emmy-nominated mini-series The Last Don (1997) and The Last Don II (1998), Rescuers: Stories of Courage: Two Families (1998), as well as the television remake of Rear Window (1998, starring Christopher Reeve). A lifelong sufferer of agoraphobia, Hannah eventually made her onstage performance debut in fall of 2000 when she won the starring role in the London production of "The Seven Year Itch." She reprised Marilyn Monroe's character from the 1955 wide screen film of the same name. Unfortunately, Hannah received mixed reviews from critics. In the same year, she also appeared in Cord (2000) and in First Target (2000, TV), and portrayed striper Angel in Dancing at the Blue Iguana (2000), which was screened at the Toronto Film Festival. Hannah continued with the supporting part of an unhappy wife of an aspiring country singer in Mark and Michael Polish's quirky drama Jackpot (2001), feature roles in Jack and the Beanstalk: The Real Story (2001,TV) and Bank (2002), and portrayed Shane West’s mother in the teen romance film A Walk to Remember (2002, starring Mandy Moore). She also had another small role in the independent movie Run for the Money (2002), before rejoining the Polish brothers in their acclaimed drama Northfork (2003). The success of Northfork marked the starting point of a critical year for Hannah. She then stared as contract killer CJ March in the action film The Job (2003), played the supporting role of Stella in the Sci-fi The Big Empty (2003) and worked with the powerhouse cast of Lili Taylor, Maggie Gyllenhaal and Marcia Gay Harden in John Sayles’ Casa de los Babys (2003). The drama film received positive reviews from critics. Hannah was put back in the Hollywood mainstream when she portrayed deadly assassin Elle Driver, opposite Uma Thurman, in Quentin Tarantino's two-part martial arts slugfest Kill Bill: Vol. 1 (2003) and Kill Bill: Vol. 2 (2004). In 2004, she also added Duplicity (2004), Yo puta (2004), Silver City (2004) and Careful What You Wish For (2004) to her resume. Recently, Hannah played roles in Lucky 13 (2005) and Supercross (2005) and will soon appear in the upcoming Love Is the Drug (2005), Living Neon Dreams (2005) and White Lies.